While WordPress is an amazing tool that makes building websites and creating content drop dead easy (and very extensible) If you have multiple WordPress websites you no doubt eventually run into maintenance fatigue. What you want to do with WordPress is focus on content, you want to write, you want to create. You don’t want to spend all of your time managing the site. You will of course occasionally need to do updates to plugins, updates to themes, core updates and even create backups… that’s a part of having a self hosted website. 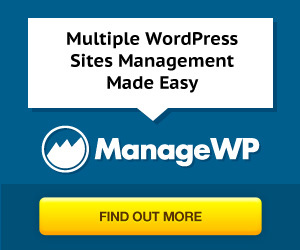 If you have several sites though this can become tedious and this is where ManageWP comes your rescue by allowing you to manage all of your WordPress sites from one place! You don’t share your password with it because you first install a plugin in your existing site; this plugin allows communication with the ManageWP servers. This also means you don’t need to go digging through your password manager or try to remember passwords for different installations because you can manage it all right from ManageWP and automatically login to the site via ManageWP if you want to. These are just few of the features, and not all are available for free (there are tiers of subscriptions… you choose the one that’s right for you). These features do make running multiple WordPress blogs infinitely more simple. So let’s take a look at some of my favorite features. This is hands down the first thing that you’ll use, and most likely the thing you’ll use the most. 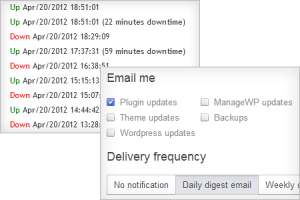 ManageWP makes managing your themes and plugins drop dead simple. 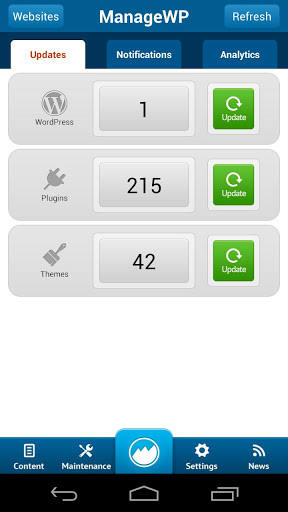 You just log in, review which of your WordPress sites have themes and plugins that need updating and with one click you can update everything. You might wonder if it’s all or nothing… it’s not. You can update by individual site or all at once. So if you have done customization to one of your sites themes and you don’t want that customization to be overwritten you can simply not update that one. With premium up-time monitoring tools, you’ll ensure that your WordPress sites will continue to run smoothly so that your business can continue to function at full capacity. But if something does go wrong, you’ll be the first to know. Want to be the first to know when there is a theme, plugin, backup, or WordPress update available to you? Enable notifications, and enjoy the peace of mind that comes with knowing your sites are up to date. Checking in on your sites’ performance is simple with Google Analytics integration. It’s baked in so all the vital information is right at your fingertips and always available. Included are SEO analysis tools so that you know where you stand and you can utilize this information to increase you search engine rankings. Keyword research and ranking tools are available so you can see which words your sites rank well for, and identify the other areas where you can improve. I wouldn’t say this is a wholesale replacement for your other SEO efforts, I’d still recommend a product like SEOPressor but it’s certainly helpful and gives you a birds eye view of your SEO efforts. You spend a lot of time creating content in WordPress; you sure be sure it’s safe. 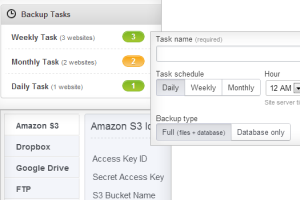 ManageWP makes backups simple via automated schedule which can occur daily, weekly, monthly and against the entire website or just the database. Once your data has gone through a backup you can store it off site. There are a lot of plugins that do automated backups but most store the backup on your server… which doesn’t do you much good if that server goes down. 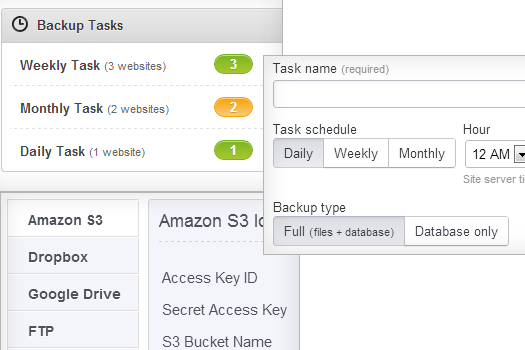 The application allows you to select remote backup options like Dropbox, Amazon S3, FTP, etc. These are probably not features you’d use everyday, though you certainly could, but when you need them ManageWP has you covered. If deploying content and websites to your customers is important, you’ll find ManageWP’s Clone tool indispensable. With it, you have the power to readily create new WordPress sites based off of existing sites. So you can create a production ready template site with themes and plugins installed and then use that site over and over for new sites. Then simply use the cloning tool to quickly and effortlessly deploy these sites in a production environment. Another powerful feature is the ability to migrate a site from one host to another. Again, this isn’t something you’d do everyday but talk about a time saver. ManageWP can Mass Migrate all of your WordPress sites from one web host and move them to another, and without all the time and effort that would be required for you to do it yourself. Now you can do all the same things on your mobile as you can from the ManageWP website. Perform backups, plugin upgrade, site stats, you name it. Now you can manage all of your sites from anywhere as long as you have your phone with you. It’s available for both iOS through the AppStore and for Android through Google Play. I haven’t played with the iOS version but my understanding is that the Android version has more capabilities than it’s iOS counterpart. ManageWP is slick and the only real comparison I could draw is Automattic’s VaultPress. After comparing the plans, the mobile app, the functionality, etc ManageWP is the clear winner in my mind. You can use a free (though limited) version with up to 5 sites for free. For more advanced functionality and the ability to manage more than 5 sites you can buy subscriptions by the month, or you can pay in 1 or 2 year increments to get discounts on the service. Click the image below or visit this link to get ManageWP for your sites now. most people, these gadgets are in great demand today.